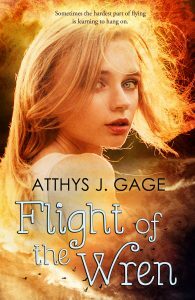 Atthys Gage is a writer with a lifelong love for myth, magic, and books. His second real job was in a bookstore. As was his third, fourth, fifth and sixth. Eventually, he stopped trying to sell books and started writing them. He has always had a fascination for that cloudy borderline between the normal and the paranormal and spends a lot of his time thinking about flying carpets and sentient flecks of alien consciousness and other stuff like that. In the so-called normal world, he lives on the coast of Northern California with his long-suffering wife, strong-willed children, and several indifferent chickens. 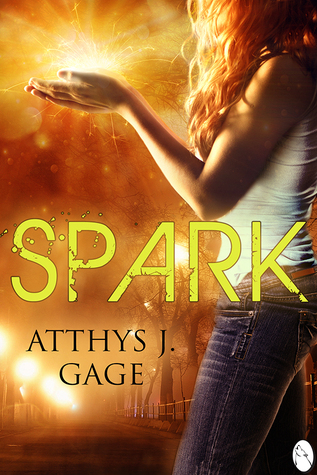 Atthys has published two books, one of which – Spark – I read and liked a lot. You can read my review of Spark here. 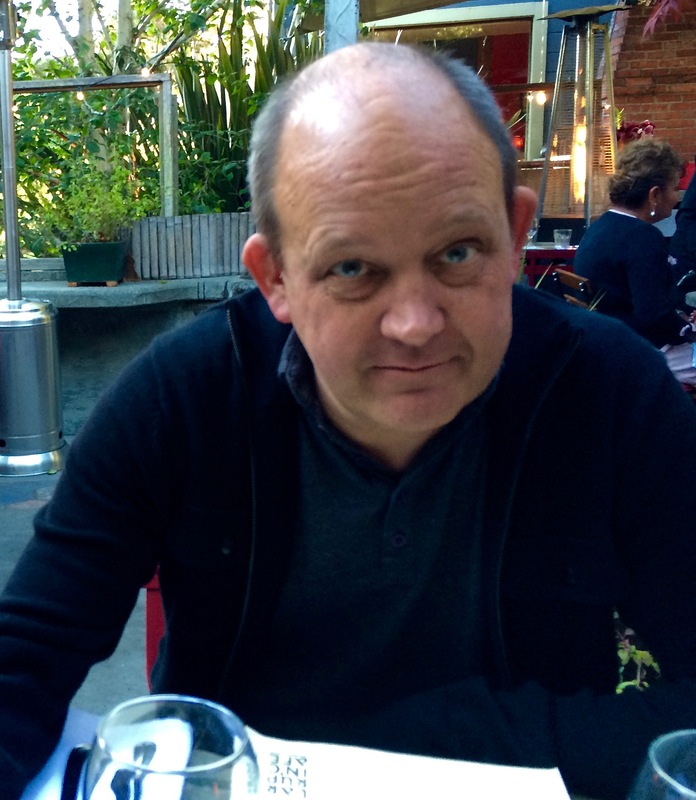 DocTom: What was the inspiration for Spark? Atthys: I’m pretty sure I was washing dishes. There’s no particular connection to dishes, but I do remember having this sudden image of a man walking past an empty lot on a city street. In the lot, a couple of homeless men are warming themselves around a fire built in an old 50 gallon metal drum. The scrap lumber fire cracks in a shower of sparks as he walks by. He doesn’t notice, but one of those sparks follows him, tracking him down the dark street, unseen. That was the birth of the idea, anyway. What was this spark? Why was it following this guy? Over the course of time, the man became a teenage girl, and the whole scene with the fire disappeared completely, but the questions remained. I had also just read China Mieville’s Un Lun Dun, and that definitely had an impact on the pocket universe scenes. Unless I’m mistaken, James Tiptree’s story All the Kinds of Yes played a part, not in terms of plot but in the concept of good guys and bad guys. That story posits the rather quaint notion that some people are just good guys and some are bad guys. I rather liked that. Francy and her friends are, for better or worse, good guys, and there’s just no point in denying it. DocTom: Francy and friends…yes, I thought you did a remarkable job describing them, their feelings, etc., but why choose a female main character? I also note that the main character in your other book, Flight of the Wren, is also female. Now, don’t get me wrong, I think that’s great, but while many of my characters are female, I just have a hard time convincing myself I’m doing them well. You seem to do it effortlessly. Atthys: I’m glad it comes off as effortless, though it certainly isn’t always so. There’s a certain rhythm you can get into with a character once you get to know them, and when you really hit it, dialogue becomes fluid and natural. I can’t pretend to know what it’s like to be a girl or a woman, but trying to get inside anyone’s mind, regardless of gender, involves constructing analogs, mapping that character’s personality onto your own so you can speak with their voice. Sometimes those analogs are pretty ramshackle, but they can still get the job done. It would’ve been so easy to make Francy, Brooke and Echo into clichés, and of course I fought back against those impulses. Most of the time anyway. Sometimes clichés are there for a reason. It’s always a tricky balancing act letting your characters be familiar and recognizable without tipping them into the mud of the banal and the obvious. That said, I’ve always identified with female characters. I’m not sure why. Of the six books I’ve written, or partially written, five have female protagonists. DocTom: Hmmm…Are any of the characters in Spark modeled after anyone? Or have you ever modeled a character in any of your work after someone you know? Atthys: Not directly. Pretty much every character is a combo platter, made up from various people I’ve known and imagined. I did steal a bit of dialogue from an overheard conversation between my daughter and her friends for a scene in Flight of the Wren. “Hey dad, isn’t that plagiarism?” she asked. She’s a writer, too. I like to think I’ve been an inspiration. DocTom: LOL. Good job! But tell me a bit about that “…cloudy borderline between the normal and paranormal….” When did you start thinking about that? Atthys: I’ve always been drawn to the uncanny, the magical realism of writers like Gabriel Marquez and Jorge Borges. That stuff slays me. I’m attracted to books where extraordinary or unexplained things happen. I like the tension. I like the way the various layers of reality rub against each other. Whatever’s happening, I strive for a vividly realist style. I think I learned that from Samuel Delany. He’s a stylistic master. Whether he’s describing a super nova or a guy shaving, it’s always rich and lucid. DocTom: Fantasy with a vividly realist style is a really difficult tightrope walk. Most readers look to fantasy for escapism. Throw in too much realism and you can lose them. Do you ever get feedback that you’re too realist? Atthys: I haven’t gotten that specific complaint, but Spark isn’t traditional fantasy. Probably readers who open it expecting a more recognizable version of fantasy end up putting it aside without finishing it. Flight of the Wren is more familiar territory for readers of urban fantasy or YA paranormal, but Spark is almost science fiction. At least the discussions of entropy and pocket universes make it seem so. Really, none of the suppositions about what Spark actually is really make very much sense, at least not in scientific terms, so I suppose it is still in the realm of fantasy and magic. But what did Arthur Clarke say? Any sufficiently advanced technology is indistinguishable from magic. At some point beyond our ability to comprehend, maybe the distinctions between science and magic really do break down. Spark the creature may be completely comprehensible from a different frame of reference. But I really haven’t answered your question. Realism can mean different things to different people, of course. I write a lot of books where paranormal things happen. Because of that, I try to treat every event, whether fantastical or ordinary, in a similar style. That’s just an aesthetic choice. I like the distinctions between the magical and the mundane to be a bit blurry. I think it adds tension to the narrative, but that’s just a personal preference. DocTom: Okay, let’s shift gears a bit. How did you get into writing? I mean I see you’ve worked in bookstores, but what generated the leap from reader to writer? Atthys: I was late arriving to the author game. I didn’t start writing my first book until I was well past 40. And even though I’ve always been a bookish sort, it wasn’t like the realization of a lifelong dream. It was more of a “I wonder if I can write a book?” kind of thing. I set myself some ground rules – mainly that I wasn’t going to spend any money on the process—no writer’s conferences, no online courses, not even a word processing program. I wrote the whole thing out in a couple of spiral bound notebooks. It was pretty good. It’s still unpublished, but it did pretty well in the very first Amazon Breakthrough Novelist Award contest back in 2008. That was the point where I began identifying myself, in my own mind anyway, as a writer. DocTom: LOL. After a lead-in like that you can’t expect to get away without telling us about your first book! Was it also fantasy? Atthys: It’s called A Quickening Wind, and, like all of my books, it’s a bit of a mongrel, genre-wise. It’s set in ancient Minoan times on Crete, and follows the adventures of a girl who leaves her small farming village tor the big city of Knossos. She’s special, of course—gifted with second sight and a warrior’s courage. I think the book walks the line fairly successfully between epic fantasy and historical fiction. It’s a lot of fun. And, of course, it’s only book one of a trilogy. Really, I think of the whole thing as one big, 1200 page book. The second part (Then the Moon Trembled) is written, but the third (A Shuddering of Stones) is still an outline. I’m definitely going to get it out there someday, even if I have to publish it myself. DocTom: Sounds really interesting, I’ll look forward to it. But at the same time you bring up another question – self-publishing. I saw your post: “Study Finds Number of Writers May Soon Exceed Readers” on the Writers’ Co-Op site (NOTE: give yourself a treat – go take a look at the Writers’ Co-op site), and I think you’ve self-published. How do you find the experience of self-publishing? Atthys: The hardest part of selling books these days is promotion. How do we get people to notice our books? I’m not sure small presses have much of an advantage over self-publishing, but that’s mostly a way of saying neither is very effective. Small presses are great for the free covers and the free editing, and they can provide a nice way of connecting with a community of other authors, but they really don’t have much more marketplace clout than an individual. An independent writer can build up an audience, but it takes a lot of work, and in most cases, it’s going to remain a cottage industry. An acquaintance of mine, a fantasy writer (who I will not name), is a case in point. I would estimate she makes somewhere around 5 or 6 thousand dollars a year in royalties (which is certainly a heck of a lot more than I do!) but she writes three or four books a year. (And I certainly know of writers who produce twice that many or more.) She works hard at promotion, too, and must have a few hundred people who will buy and read her new books without fail. It’s a whacky business model. She’s waiting, I suppose, for a certain critical mass of public awareness to tip her into the big time; or for that one breakthrough title. Personally, I can’t write that many books. I’m doing well if I produce one a year. And since I’m not a series writer, my earlier books don’t automatically promote my later ones. DocTom: Hmmm…so how would you sum up your overall experience to date as a writer, and do you have any advice for prospective authors out there. Atthys: If I had any really good advice, I’d take it myself. Probably I’m my own worst enemy, marketing-wise. My books don’t fit easily into any one genre, I don’t write in series, every book is different from the last. This is fun for me as a writer, but frustrating, maybe for readers who expect serials, or at least consistency of genre. 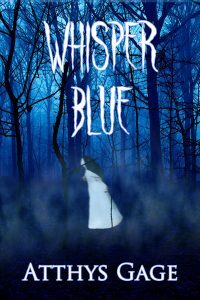 My newest book, Whisper Blue, is a cyber ghost story (available here). 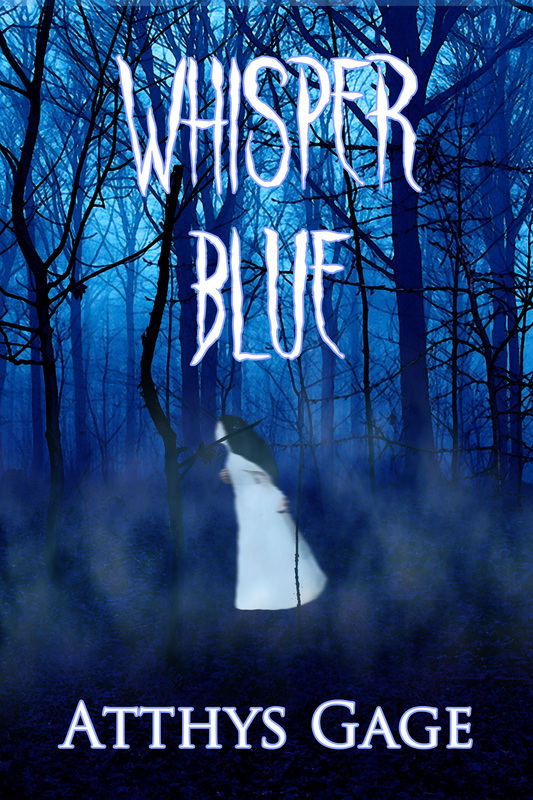 My next book is actually a twist on the lover’s triangle motif, a paranormal romance. Neither one is for younger readers. So as far as advice goes, well, if you want to be successful, don’t do what I do. On the other hand, I can’t picture anyone being happy as a writer if you aren’t writing what you really want to write. So maybe there is no real choice in the matter. Be true to yourself so that you might be truly true to your art. And vice versa. Flight of the Wren and Whisper Blue. Thanks to both for a very informative interview. As always, it helps a lot to have read and enjoyed the book – I love then seeing behind the scenes, and the interview format here allows precisely that.